Not everyone knows the risks that come with using public Wi-Fi. If you're traveling this summer, learn the basics of secure Wi-Fi use, so hackers don't get your personal information and commit fraud with it. 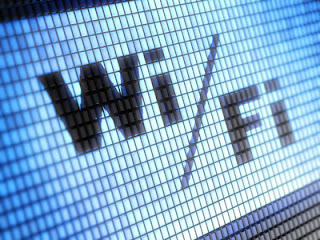 Most places that offer public Wi-Fi make it pretty easy for customers to get online. There are usually minimal login requirements, and to avoid encryption compatibility issues, they tend to disable many of the security features that are built into the wireless device. However, without encryption, your data passes unprotected, just like a radio signal. According to the identity theft experts Life Lock, always check the network names. Thieves often create near-identical networks to the public networks people are accessing, and these signals can be intercepted by anyone who has a compatible receiver and some basic, easily acquired tools. If the Wi-Fi you're using isn't encrypted, your data is open to theft. From a login and password at your bank to a private email you've sent, it's all fair game to cybercriminals. A tech-savvy hacker is armed with the skills, tools and patience needed to work around the limited protection measures many Wi-Fi hosts employ. For example, some use social engineering methods to trick Wi-Fi users into divulging their most sensitive information. Through wi-phishing, a cybercriminal is able to hijack a wireless signal and replace it with one of his own. He can spoof the network name and replace the sign-in page with a duplicate. You'll then supply your information to the hacker, not the Wi-Fi provider. From there, you may be redirected to other fraudulent or virus-filled websites. You might even be tricked into providing credit card numbers or other sensitive information. Don't allow your device to automatically join Wi-Fi networks. Manually select the desired network after connecting. Be sure you're on a legitimate network; check with the business offering the Wi-Fi to confirm the details. Stay aware of your surroundings. Ensure that nobody is looking over your shoulder when logging in to your accounts. Don't leave your computer unattended. Don't bring sensitive data on your hard drive when traveling. Don't do online banking at a public hotspot. Don't surf pages you wouldn't want others to know you're viewing. Limit email to casual communications; don't send anything sensitive. Turn off your wireless card when not in use. Public Wi-Fi hotspots can be convenient while you're traveling, but you should take some precautions when using them. Protect your computer, your data, your identity and your privacy by following the tips above. When you know you're safe online, you'll be able to relax and enjoy your trip to the fullest.